A cheeky short film I made. The short story touches on the financial struggles many of us face in modern times, if not living hand to mouth, struggling to find work. The ending of this short film shouldn’t be taken literally! Ultimately, this short film is a bit of fun and a way of me getting use to the software and equipment I have on hand. Please share wherever you can! The above picture probably means very little to you, especially as we can hardly see it (damn computers! ), it may turn out to mean not much to me either! But… it states the end result of my free book 3 day promotion. If you want any of my work now, you’ll have to dig deep into your pockets and gather up a few bucks of your hard-earned cash! Son of a Serial Killer was downloaded just shy of 6000 times, which means that lots of people who have never heard of me until this weekend now have the chance to switch on their kindle and see what my work is all about. I fully understand not everyone who downloads a free book will get around to reading it, but some do, and I have a new 5 star review already to prove it! To summarise, Friday went ok for ‘SoaSK’ with over a thousand downloads recorded, then Saturday things took a turn for the worse and I saw only few hundred downloads between Saturday morning and Sunday evening. I was cursing my lack of funds to provide a good marketing platform for the promotion as I drifted off to sleep last night, after seeing my position on the free kindle charts drift further and further from the number 1 spot, and even the more achievable top 100 chart. As you can see above, that Sunday evening, the people of America who were on the net obviously took a shine to my psychological thriller and added it to their collection. I talk of the US, by the way, as most websites that promote free books (for free) are marketed towards that audience, so most links that I used when promoting my giveaway were Amazon.com links and not .co.uk (please forgive me, motherland). So I got to #35 in the kindle store and down to #6 in the thrillers list! My stay there would have been short-lived as the promo ended just hours later, so I’m not expecting miracles to happen regarding after-promo sales. However, thousands more people have my work, which means there is potential for them to purchase my other books and maybe my projects of the future too (if they were suitably impressed of course). Extremely England, my satirical comedy, didn’t do as well, but this was to be expected in a more niche market. Still, 230 copies dished out may get me some reviews, so it’s not bad at all. That plus the fact I’ve started randomly attacking people who cannot demonstrate an adequate sense of humour. Just to clarify, I didn’t pay for any advertisement over the weekend, and if I did, perhaps my books would have taken over the world! AS usual, I used this helpful page of David McGowan’s website and a few Facebook groups that I stumbled across. If I see any notable changes in how sales go/reviews are made over the next couple of weeks I shall report back! Ciao for now, Jams N. Roses. Extremely England – Brand spanking new release! Extremely England – Satirical, farcical, comical fun! ‘Extremely England’ is different to everything I have written up to this point, and is my (somewhat distorted?) current perspective on my country of birth; what it has become, the way it is run and how it is reported on by the media among other things. When I was young, I was proud to be English and believed England was the centre of the universe! Oh, how we learn as we grow up… Please don’t get me wrong, I am not ashamed to be English, or British, but I now realise that it doesn’t matter who you are or where you are from, the chances are that you are standing right next to an idiot at this very instant. I hope you enjoy the book , if not, get a sense of humour! 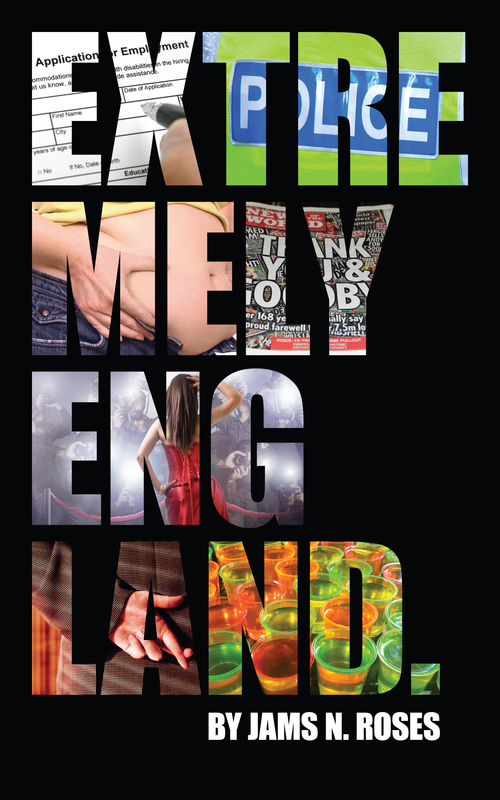 A satirical story, ‘Extremely England’ is a naughty novella full of farcical fun! In order to win votes from a certain section of the voting public, the Plebbs blackmail the mayor into giving the job to an unknown candidate of their choice. Due to fear of humiliation and the probability of losing his wonderful wife, the mayor cannot bring himself to spill the beans to his old friend, Bobby. After some scandalous defamation of his character, the out of favour policeman then has to rely on his hopeless journalist wife, Maggie, and her lay-about brother, Guy, to help him bring down the criminal masterminds and stop the corruption, thus claiming his rightful place at the top of Britain’s Police Force. Contains rude and crude humour – Not for the easily offended! The satirical story, the farcical fun, the naughty novella that is ‘Extremely England’ is getting closer and closer to the finish line! It’s been brilliant fun working on a manuscript so different to my past projects, and almost a relief not to have to tap into the darker side of my thoughts to create the sinister and moody environments for the plot to unfold. The mayor had been in the business long enough to have a bloody good idea as to who was forcing his hand and blackmailing him, that and the fact that Harriet had signed her name at the bottom of the page; no publicity is bad publicity and all that. The whole tone of the narrative was carefree. There are situations in ‘Extremely England’ that in another novel would have to be deemed serious and thoughtful, but that just wasn’t the case here, and I loved it! As I’ve said in a previous post, the early Woody Allen films were a big motivator for me to do a project like this, and by that, I mean the throwaway remarks that didn’t add anything to the story or plot, they were just there for entertainment value, for comedy reasons and with no consequence. Is there a message in this book that I want readers to take home with them? Probably not, maybe to not take life so seriously all of the time. This is a novella that provides an escape from the misery that we are told we are up to our necks in by our politicians and our national press. This is for those who watch the news, or read the tabloids, and choose to laugh and not cry. So, I’m nearing the end of draft zero of the manuscript for Extremely England, and I must say, my sense of humour is questionable! I originally wrote the screenplay version of this story whilst spending too much time watching older Woody Allen films and reading the Daily Mail – The idea being a satirical look at life in modern England, which is all well and good. However, although some of the situations, one-liners and jokes are very funny to me, I wonder how well they will be taken by others. But will I change my humour? No, how can I? I guess I’ll just have to hope that upon completion, I can find the right readers for my latest project, like people who don’t mind laughing at themselves, or those that don’t take offence on the behalf of others (a real pet hate of mine). In summary, how it stands at the moment, Extremely England (working title?) is rude, crude and extremely childish. When I look at the UK tabloids, it really is a case of ‘if I don’t laugh, I’ll cry’ – so I’m going to stick to laughing, even if it isn’t to everyone’s taste.